219 Boys • 8 Ball • All Good Funk Alliance • Ben Anderson • Deckard • Derek Hena • DJ Icon • DJ Mancub • DJ Phleck• DJ Platurn • DJ Tyme• Dulce Vita • Faultline Breaks ft. Eric Riggsbee & Justin Johnson • Femmes Afire • Gordo Cabeza • Grensta • Iggy • Justin Milla • Little John • Michael Milano • Ren the Vinyl Archaeologist • Shooey • Sol • Sound it Out! yes, this boat leaves the dock,so don’t (literally) miss the boat! 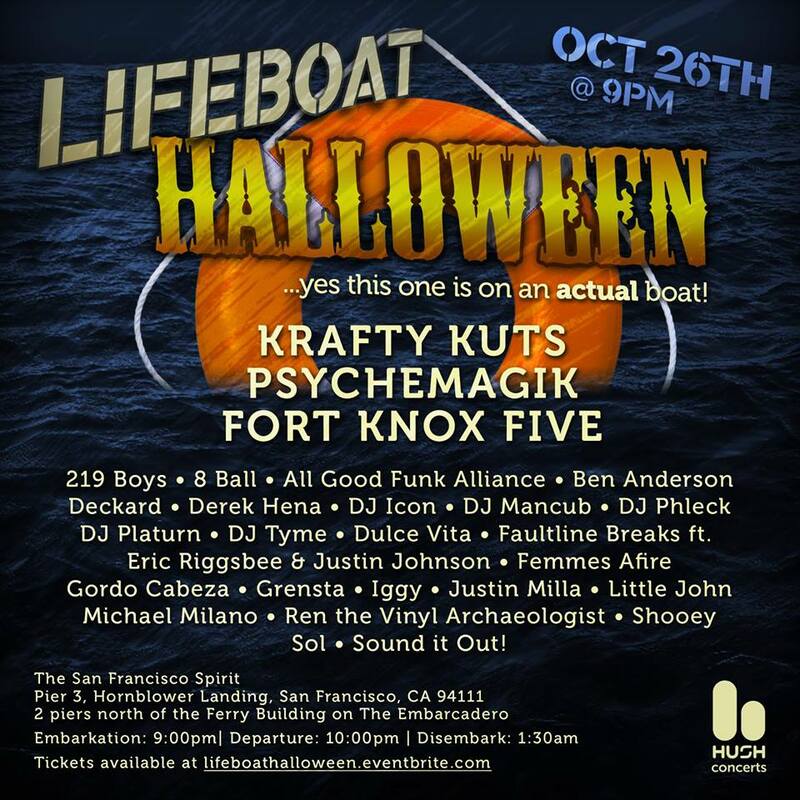 DETAILS: Bail out of the basic on Halloween weekend and dive into something scenically inspiring and musically thrilling, LIFEBOAT HALLOWEEN. The Lifeboat will set sail San Francisco Bay on Friday, October 26 on the Hornblower Luxury Cruiser SAN FRANCISCO SPIRIT from 9:30pm-1:15am (loading from 8:30-9:30pm at San Francisco’s Pier 3). While you cruise, get hosed down with the world-class sounds of international superstar DJs KRAFTY KUTS (UK), PSYCHEMAGIK (UK) and FORT KNOX FIVE (Canada) on a custom sound system. Joining them will be a rogue’s gallery of 25+ of the Bay Area’s finest DJs including 219 Boys, 8 Ball, All Good Funk Alliance, Ben Anderson, Deckard, Derek Hena, DJ Icon, DJ Mancub, DJ Phleck, DJ Platurn, DJ Tyme, Dulce Vita, Faultline Breaks, Femmes Afire, Gordo Cabeza, Grensta, Iggy, Justin Milla, Little John, Michael Milano, Ren the Vinyl Archaeologist, Shooey, Sol, and Sound it Out! performing on 2 systems and 3 silent disco channels. This is a 21+ rain or moonshine event – night-time on SF Bay. Please costume accordingly. Bottle Service Reservation Includes: 5 Tickets, a VIP table with premium positioning on the headliner deck and your first bottle of call liquor.